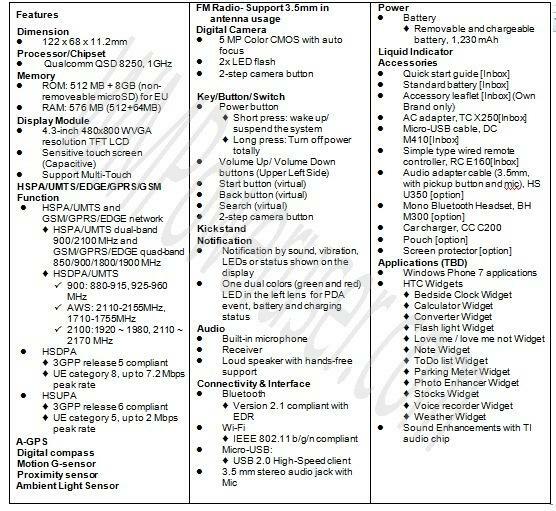 Today pictures and spec sheets of the much awaited HTC HD7 were leaked online. 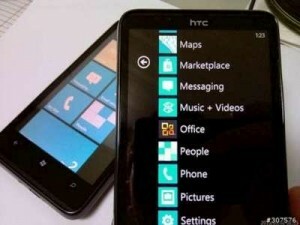 BGR reported that the leaks on the HTC HD7 which is slated to run as the Windows Phone 7 Smartphone. The HTC HD7 is set to launch with in the next few weeks. It boasts of a 4.3 inch WVGA capacitive touch screen and runs a 1GHz Qualcomm QSD8250 Snapdragon processor. The phone comes with a 5 megapixel camera with two LED flashes which support HD video recording. The phone 8GB built in storage and runs on a 576 MB of RAM. Other features include dual-band HSPA radio, quad-band GSM radio, Wi-Fi, Bluetooth 2.1and a-GPS, digital compass as well as FM radio. The phone also has a microSD expansion slot.